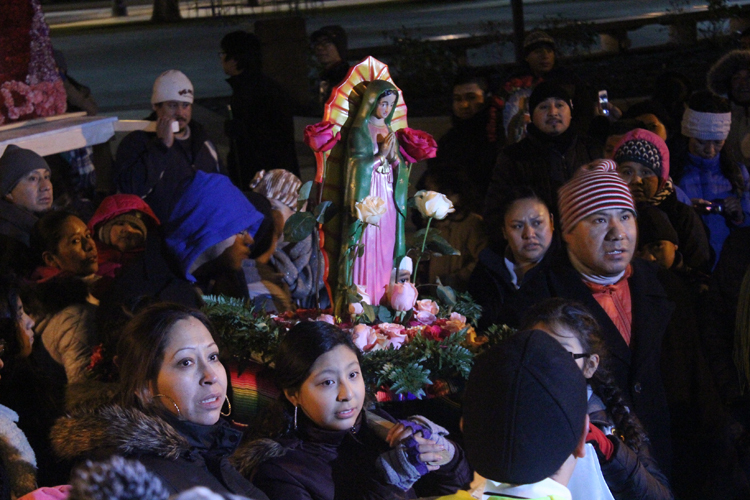 Children carry a statue of the Blessed Mother in procession. 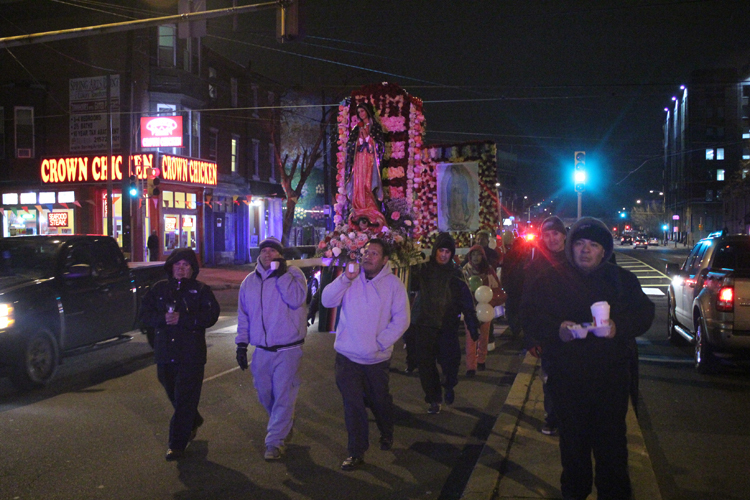 Men and women carried large displays honoring Mary, some with painted images and flowers, some with statues and brightly colored decorations. 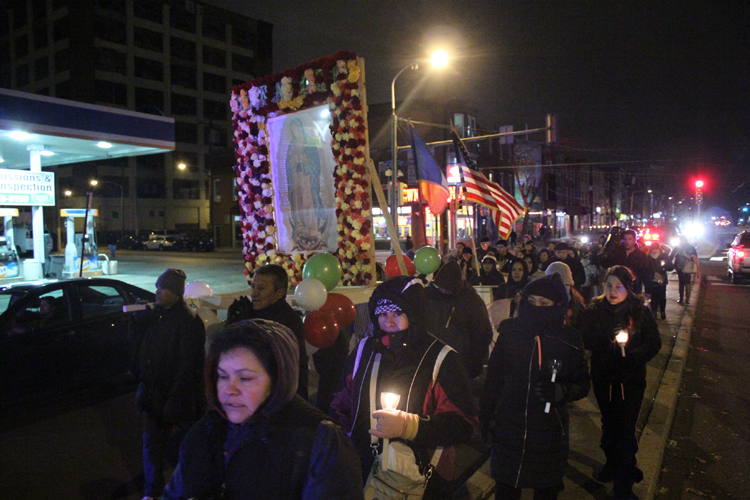 Walkers in the procession carry the flag of their homeland, Mexico, and the flag of their new home, the United States of America. 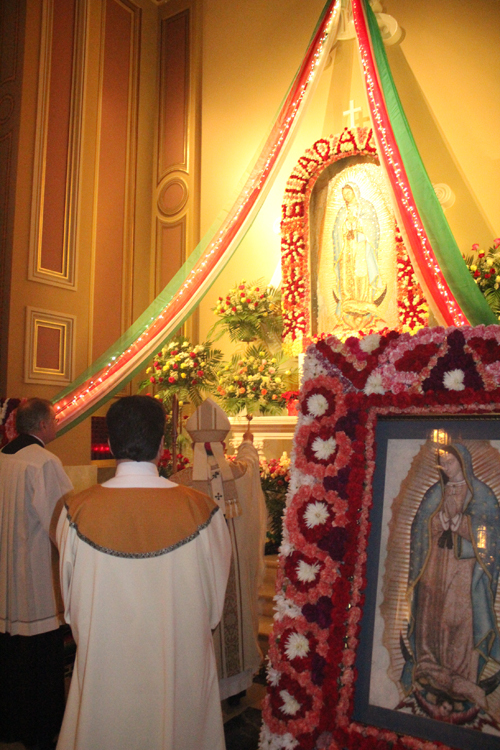 The faithful of Visitation B.V.M. 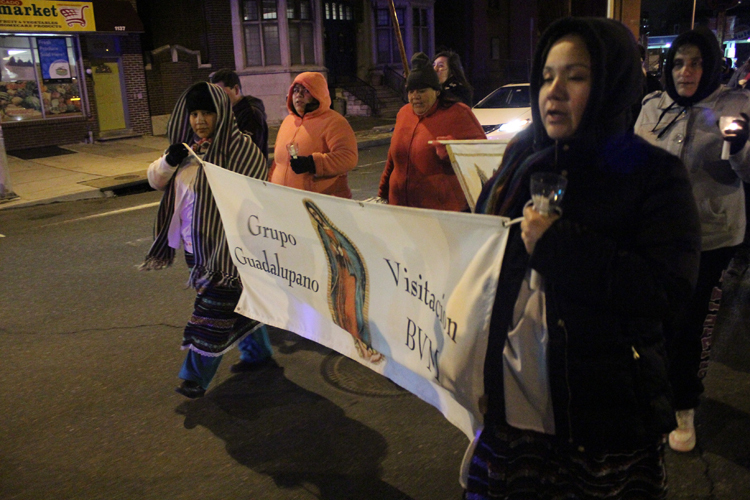 Parish in the city’s Kensington section carry a banner as they proceed to the cathedral. 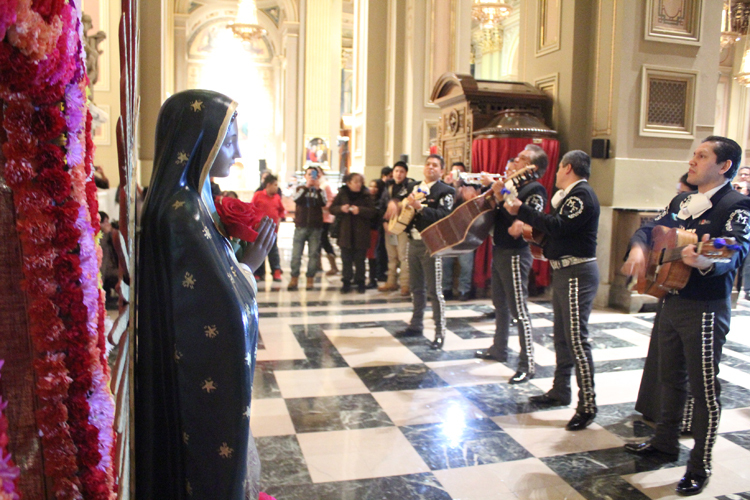 The mariachi band serenades Mary at the shrine of Our Lady of Guadalupe in las Mananitas, the procession and ritual preceding the Mass at the cathedral. 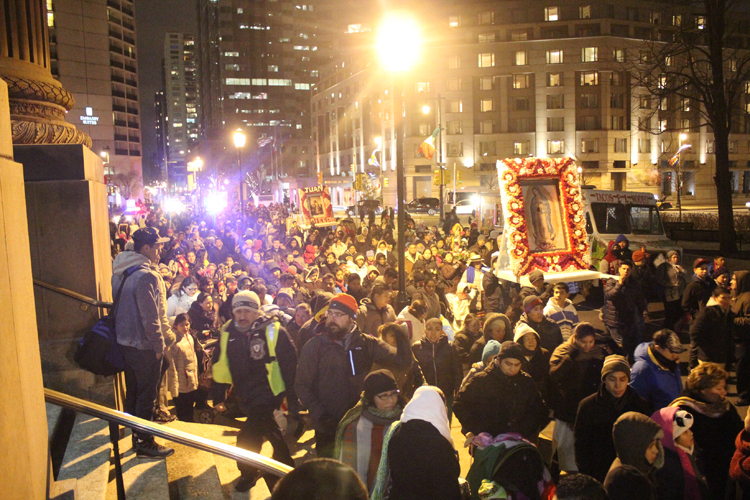 The huge procession makes its way to the front of the cathedral on 18th Street. 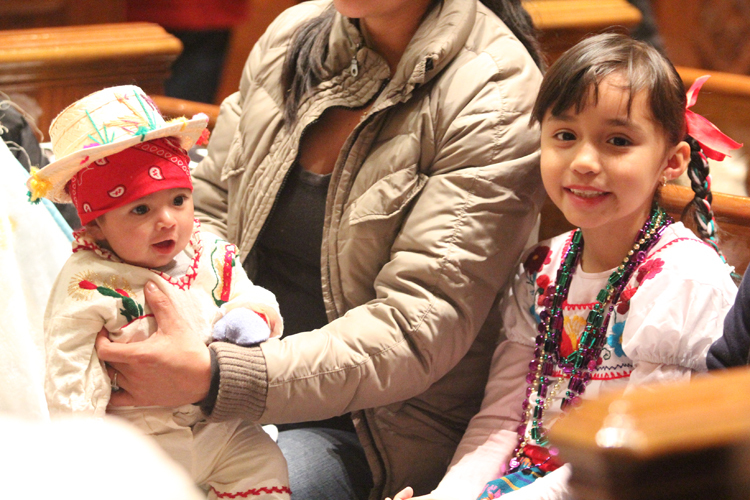 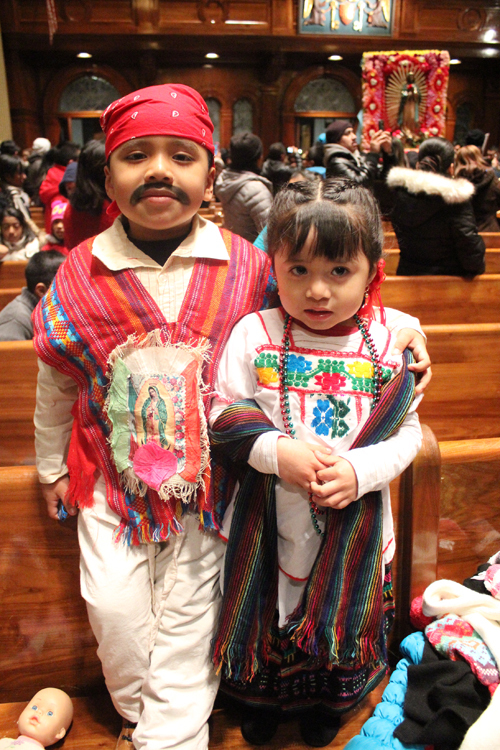 Typically at the Mass, children dress in traditional Mexican attire and also as St. Juan Diego. 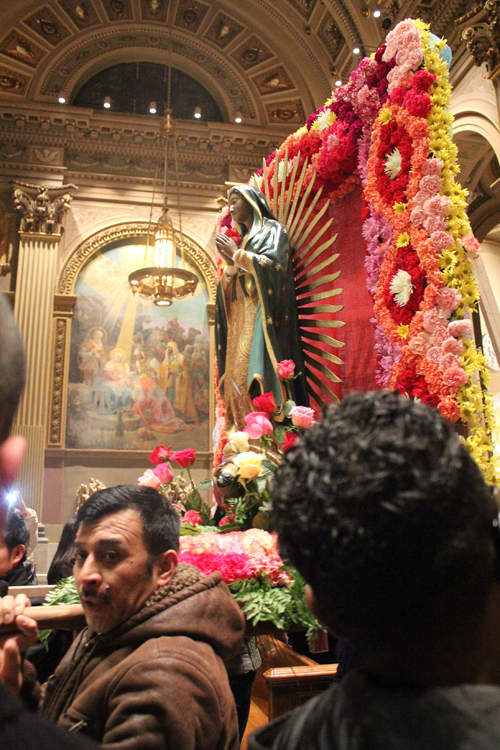 People with cameras of all kinds wanted to remember the images of Our Lady in the cathedral. 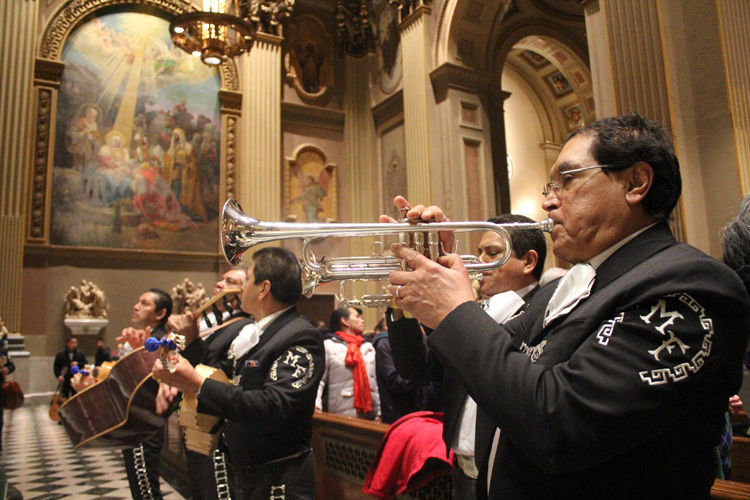 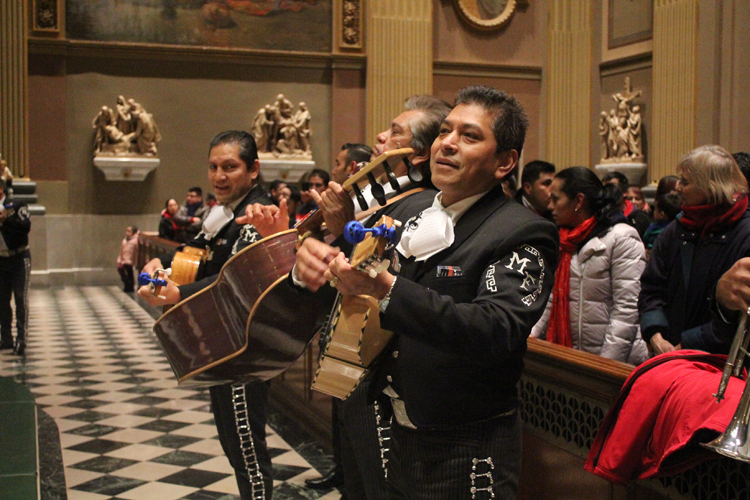 Members of el Mariachi Flores, a mariachi band, provide music in the cathedral. 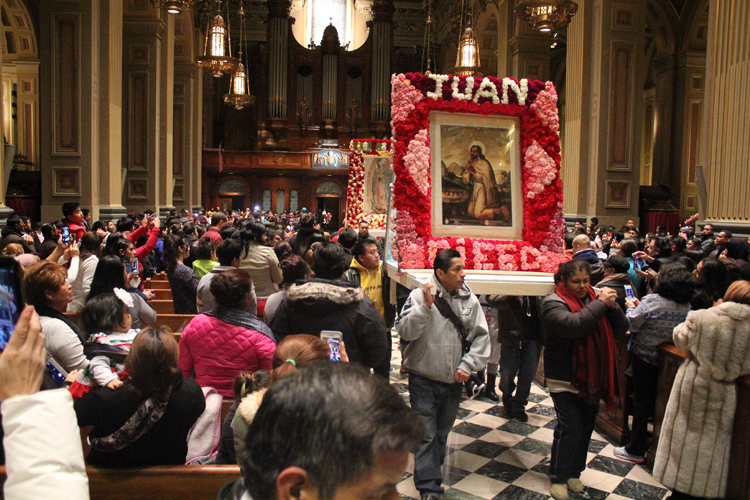 St. Juan Diego, who witnessed apparitions of Our Lady of Guadalupe in 1531 and revealed her to Mexican church authorities, was also honored in the procession. 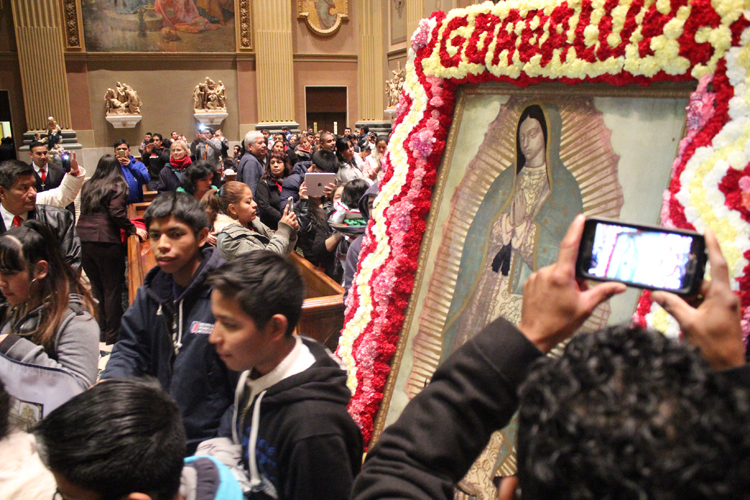 Archbishop Chaput blesses the cathedral’s shrine to Our Lady of Guadalupe, decorated by the faithful for the occasion of the feast day. 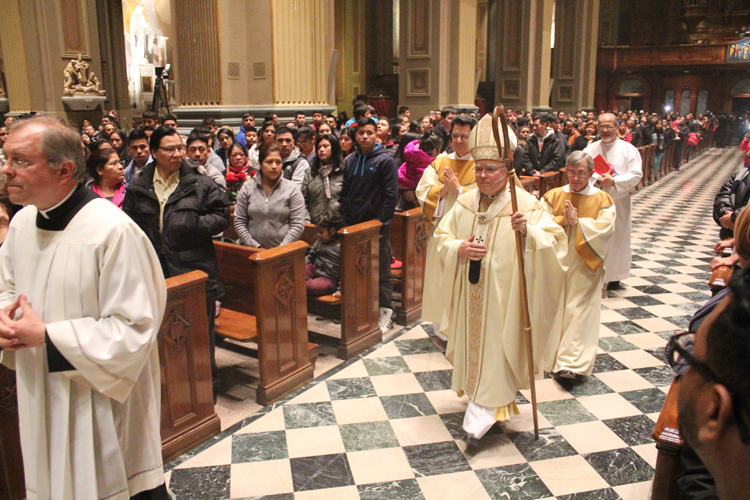 Archbishop Chaput processes up the center aisles of the packed cathedral at the start of Mass. 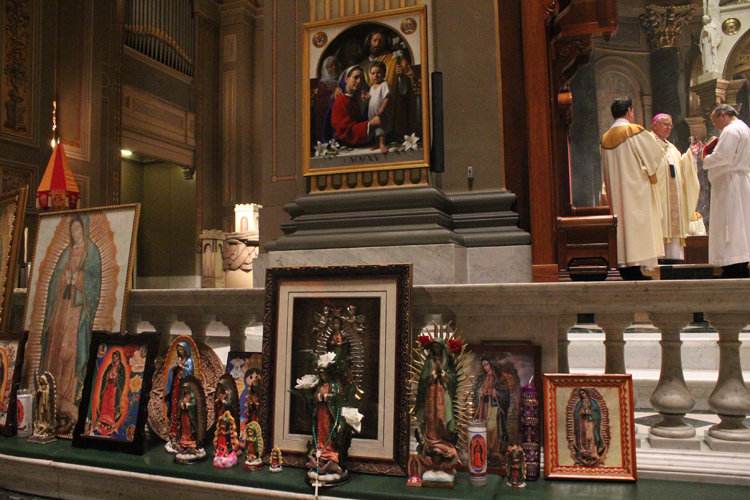 Images of Our Lady of Guadalupe brought by people attending the Mass line the altar rail of the cathedral as Archbishop Chaput prays the collect prayer during Mass.